The New York Philharmonic’s 2019–20 season, Jaap van Zweden’s second as Music Director, will fuse past and present, representing today’s composers and the new-music landscape while reflecting on relevant historic achievements. As in van Zweden’s inaugural season, the Philharmonic reaffirms its vital commitments to serving as New York’s Orchestra and to championing new music. The season is also distinguished by dynamic collaborations with groundbreaking artists, as well as landmark appearances in the US and abroad. In his second season as Music Director, Jaap van Zweden will conduct a wide range of repertoire, including six World Premieres and symphonic cornerstones. As in his inaugural season, he has prioritized connecting with New York City through impactful projects, special concerts, and collaborations with other cultural institutions. Jaap van Zweden will also lead the Orchestra on the international stage, both in China and on his first European tour as Music Director. Jaap van Zweden begins his second season by conducting the opening subscription program, September 18–21, 2019, featuring the World Premiere of a New York Philharmonic commission by Philip Glass; Barber’s Knoxville: Summer of 1915 with soprano Kelli O’Hara; and selections from Prokofiev’s Romeo and Juliet. The program marks the Philharmonic’s first-ever commission of a work by Philip Glass. Jaap van Zweden led the Philharmonic’s first performance of a symphonic work by Philip Glass in his opening concert as Music Director Designate in the 2017–18 season. The New York Philharmonic will present the US Stage Premiere of director / designer Bengt Gomér’s production of Schoenberg’s Erwartung and Bartók’s Bluebeard’s Castle, both conducted by Jaap van Zweden, September 26–28, 2019. Bengt Gomér’s fully staged production — premiered by the Royal Stockholm Philharmonic Orchestra in January 2019 — incorporates video, lighting, and shadow actors to integrate the two operas into a complete narrative united by an exploration of the subconscious. Bluebeard’s Castle will feature soprano Nina Stemme (debut), recipient of the 2018 Birgit Nilsson Prize, as Judith and baritone Johannes Martin Kränzle (debut) as Duke Bluebeard; Erwartung will feature mezzo-soprano Katarina Karnéus as A Woman (debut). As a prologue to Erwartung, Ms. Stemme will sing the early Schoenberg song Erwartung from Four Songs Op. 2; Ms. Karnéus will recite the Bard’s Prologue for Bluebeard’s Castle. Composed within two years of each other at the turn of the 20th century, the one-act operas each center on the psychology of a woman in relation to her lover. These performances will be complemented by a GRoW @ Annenberg Sound ON concert on the theme of narratives at The Appel Room, Jazz at Lincoln Center on October 1, 2019. More information is available at nyphil.org/bluebeard. Project 19 will mark the centennial of the ratification of the 19th Amendment with commissions by 19 female composers; the multi-season initiative will launch with eight World Premieres in 2019–20, six during a three-week focus in February 2020. The three-week hotspots festival will spotlight three new-music centers — Berlin, Reykjavík, and New York — through subscription programs and new-music concerts across the Lincoln Center campus in May–June 2020. Before the Philharmonic opens the Concertgebouw’s Mahler Festival as the first American orchestra in the festival’s 100-year history, Jaap van Zweden and the Philharmonic will examine Mahler’s time in New York as composer and as the Philharmonic’s tenth Music Director through Mahler’s New York in April 2020. Jaap van Zweden will lead six World Premieres commissioned by the New York Philharmonic — by Philip Glass, Tania León, Nico Muhly, Sarah Kirkland Snider, Nina C. Young, and Ellen Reid — as well as a New York Premiere by Steve Reich. For the second season, Jaap van Zweden and the New York Philharmonic will invite its fellow New Yorkers to Phil the Hall, April 3, 2020. Jaap van Zweden will also connect with the Philharmonic’s younger audience members at the season’s opening Young People’s Concert, December 7, 2019, his first time conducting the Philharmonic’s signature education series. Jaap van Zweden will lead works by composers ranging from Beethoven, Tchaikovsky, Shostakovich, and Schoenberg to Björk, Steve Reich, Philip Glass, and John Adams. He will lead symphonic masterworks such as Mozart’s Mass in C minor; Bruckner’s Symphony No. 4, Romantic; Shostakovich’s Symphony No. 5; Mahler’s Symphonies Nos. 1 and 2, Resurrection; and John Adams’s Harmonium. 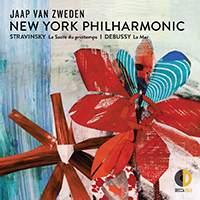 More information on Jaap van Zweden’s second season is available at nyphil.org/jaap. Jaap van Zweden and the New York Philharmonic will mark the centennial of the ratification of the 19th Amendment, granting equal voting rights to women, by commissioning works by 19 women. The multi-season Project 19 initiative will launch with three consecutive weeks in February 2020, each featuring a World Premiere complemented by collaborations with partners across the city. The 19 commissioned composers, whose works will be premiered over multiple seasons, are Unsuk Chin, Mary Kouyoumdjian, Joan La Barbara, Tania León, Nicole Lizée, Caroline Mallonee, Jessie Montgomery, Angélica Negrón, Olga Neuwirth, Paola Prestini, Ellen Reid, Maria Schneider, Caroline Shaw, Sarah Kirkland Snider, Anna Thorvaldsdottir, Joan Tower, Melinda Wagner, Nina C. Young, and Du Yun. Jaap van Zweden will conduct the Orchestra in the first three Project 19 World Premieres. 2015 Rome Prize winner Nina C. Young’s commission will be premiered February 5–6, 8, and 11, 2020. Pulitzer Prize–nominated Tania León’s commission will be premiered February 13, 15, and 18, 2020. Ms. León will also curate a new-music program as part of Nightcap at the Stanley H. Kaplan Penthouse, February 15, 2020. The Project 19 commission by Ellen Reid — co-founder of Luna Composition Lab, a mentorship program for young self-identified female, non-binary, and gender non-conforming composers — will be premiered February 20–22, 2020. As part of Project 19, the Philharmonic will partner with The Metropolitan Museum of Art’s MetLiveArts performance series and The Juilliard School on the co-presentation of a new, site-specific production of Virgil Thomson’s The Mother of Us All — an opera on the life of Susan B. Anthony with a libretto by Gertrude Stein — at The Metropolitan Museum of Art, featuring musicians from the Philharmonic and vocalists from Juilliard’s Marcus Institute for Vocal Arts. The production will mark the Philharmonic’s first time performing music from The Mother of Us All since 1959. The Philharmonic will also partner with the Academy of American Poets in commissioning 19 new works by women poets; details will be announced at a later date. More information on Project 19 is available at nyphil.org/project19. Jaap van Zweden and the New York Philharmonic will conclude the 2019–20 season with the three-week hotspots festival, May–June 2020, spotlighting three global hotbeds of classical music innovation — Berlin, Reykjavík, and New York — each represented by a World Premiere by a composer associated with that city. Each of the commissioned composers will curate a Nightcap concert. The second program will center on the World Premiere of Nico Muhly’s Concerto for Two Pianos, commissioned by the Philharmonic, with Katia and Marielle Labèque as soloists and conducted by Jaap van Zweden, June 4–6 and 9, 2020. Nico Muhly co-founded the Reykjavík-based collective / record label Bedroom Community with Icelandic producer Valgeir Sigurðsson, whose studio in Reykjavík serves as the Bedroom Community’s incubator. The collective is distinguished by cross-overs between classical and non-classical musicians. The Philharmonic’s Marie-Josée Kravis Creative Partner Nadia Sirota is also an integral member. Nico Muhly will curate a new-music program as part of Nightcap at the Stanley H. Kaplan Penthouse on June 6, 2020. The final program will spotlight a World Premiere by Sarah Kirkland Snider conducted by Jaap van Zweden, June 11–13, 2020. In 2007 Sarah Kirkland Snider co-founded (along with William Brittelle and Judd Greenstein) New Amsterdam Records, a Brooklyn-based record label, presenter, and artist service organization that supports the public’s engagement with new music by composers and performers whose work does not adhere to traditional genre boundaries. Sarah Kirkland Snider’s new work is a Philharmonic commission as part of the Project 19 initiative. Sarah Kirkland Snider will curate a new-music program as part of Nightcap at the Stanley H. Kaplan Penthouse on June 13, 2020. More information on the hotspots festival is available at nyphil.org/hotspots. Jaap van Zweden and the Philharmonic will celebrate composer and former Philharmonic Music Director Gustav Mahler in both New York and Europe. In New York, the Philharmonic will connect New Yorkers to the composer / conductor who spent time in New York as the Philharmonic’s tenth Music Director (1909–11) through Mahler’s New York in April 2020. After celebrating Mahler in New York, the Philharmonic will embark on its 2020 European tour and open the Concertgebouw’s Mahler Festival — which began 100 years ago and takes place every 25 years — as the first American orchestra in the festival’s history. The second Mahler’s New York program, April 23–25, 2020, will feature Mahler’s Symphony No. 2, Resurrection, with soprano Joélle Harvey, mezzo-soprano Sasha Cooke, and Concert Chorale of New York. Mahler conducted the New York Philharmonic in the US Premiere of his Resurrection Symphony in 1908. The New York Philharmonic performed Mahler’s Resurrection Symphony to commemorate the tenth anniversary of 9/11 and two days after President John F. Kennedy’s assassination, in a televised concert led by Leonard Bernstein. Mahler’s New York will also feature Mahler Grooves, a low-cost, one-night-only concert, April 17, 2020, that will aim to connect New Yorkers to the Philharmonic’s tenth Music Director. The program will feature Mahler’s Songs of a Wayfarer with baritone Roderick Williams and Symphony No. 1. More information will be announced at a later date. The New York Philharmonic will further explore Mahler’s time in New York through a New York Philharmonic Archives exhibit and walking tour of Mahler’s New York. No. 2, Resurrection. The Mahler Festival 2020 will include performances of all of Mahler’s symphonies by the New York Philharmonic, Vienna Philharmonic, Berlin Philharmonic, and Royal Concertgebouw Orchestra, all of which Mahler conducted and which will be heard together in Amsterdam for the first time. The New York Philharmonic Archives will present its exhibit about Mahler’s New York at London’s Barbican Centre, also as part of the 2020 European tour. More information on Mahler’s New York is available at nyphil.org/mahlerny. Pianist Daniil Trifonov will serve as The Mary and James G. Wallach Artist-in-Residence for the 2019–20 season. He will perform two concertos with the Orchestra, both led by Jaap van Zweden: Scriabin’s Piano Concerto, November 27 and 29–30 and December 3, 2019, and Mozart’s Piano Concerto No. 25 in New York, April 15–16, 18, and 21, 2020, and on the European tour. He will also perform an all–J.S. Bach recital at Alice Tully Hall on March 3, 2020 — presented in association with Lincoln Center’s Great Performers series — and chamber music with the New York Philharmonic String Quartet on December 1, 2019, at 92nd Street Y in a program that will include the New York Premiere of Mr. Trifonov’s own Piano Quintet. The Philharmonic’s relationship with Daniil Trifonov, Musical America’s 2019 Artist of the Year, began with his critically acclaimed Philharmonic debut in 2012 at the age of 21. In November 2015 he was the featured soloist in Rachmaninoff: A Philharmonic Festival and subsequently joined the Philharmonic Board of Directors. He was the soloist for Jaap van Zweden’s first week as Music Director, performing Ravel’s Piano Concerto in G major on the Opening Gala Concert and Beethoven’s Emperor Concerto in the opening subscription program. More information on Daniil Trifonov’s residency is available at nyphil.org/trifonov. Soprano Renée Fleming will join the Philharmonic, led by Jaap van Zweden, in songs by Icelandic singer / songwriter Björk, orchestrated by Hans Ek — Virus, Joga, All Is Full of Love, and Undo — February 20–22, 2020. She recorded the first three songs in her 2017 Decca album Distant Light (also featuring Anders Hillborg’s The Strand Settings, which Ms. Fleming premiered with the New York Philharmonic in 2013). Both Ms. Fleming and Björk are recipients of Sweden’s Polar Music Prize. For the second year, Jaap van Zweden and the New York Philharmonic will invite its fellow New Yorkers to Phil the Hall, a low-cost performance led by Jaap van Zweden at David Geffen Hall, April 3, 2020. Repertoire and artists will be announced at a later date. More information on Phil the Hall is available at nyphil.org/philthehall2020. The Philharmonic will present its Annual Free Memorial Day Concert at The Cathedral Church of Saint John the Divine on May 25, 2020. The conductor and program will be announced at a later date. The New York Philharmonic Concerts in the Parks, Presented by Didi and Oscar Schafer, will return for its 55th season in June 2020, bringing free Philharmonic concerts to all five New York City boroughs. Details will be announced at a later date. Nightcap and Sound ON, the two new-music series introduced in Jaap van Zweden’s inaugural season, will return in the 2019–20 season with seven late-night concerts curated by today’s composers and three evening chamber concerts performed by Philharmonic musicians. The Marie-Josée Kravis Creative Partner Nadia Sirota will return as host of both series and curator of Sound ON. Nadia Sirota is a viola soloist and member of the ensemble yMusic. A leader in the new-music community, she won a Peabody Award as host and producer of the podcast Meet the Composer, and in 2019 she launches a new podcast and concert series, Living Music with Nadia Sirota. The Kravis Nightcap series will present seven late-night, cabaret-style concerts curated by contemporary composers who will engage in conversation about the music with host Nadia Sirota. Taking place at the Stanley H. Kaplan Penthouse after select subscription programs, the concerts explore themes related to those Philharmonic concerts in a casual setting. Curators for the 2019–20 season will include Laurie Anderson on October 5, 2019; Bryce Dessner on November 16, 2019; Steve Reich on December 7, 2019; Tania León on February 15, 2020; Olga Neuwirth on May 30, 2020; Nico Muhly on June 6, 2020; and Sarah Kirkland Snider on June 13, 2020. The GRoW @ Annenberg Sound ON series — three evening chamber concerts at The Appel Room, Jazz at Lincoln Center — presents contemporary chamber repertoire performed by Philharmonic musicians. The concerts dive deeper into the season’s key initiatives and explore the music of our time through the performer’s lens. Host and curator Nadia Sirota leads conversations with the musicians, exploring what they love about the works they are performing — what is difficult, new, and unexpected. The 2019–20 Sound ON concerts are: “Telling Tales” on October 1, 2019, tied to the staging of Bluebeard’s Castle and Erwartung; “Leading Voices” on February 3, 2020, tied to Project 19; and “Mapping Berlin” on June 1, 2020, tied to the hotspots festival. More information on the two new-music series is available at nyphil.org/nightcap and nyphil.org/soundon. The New York Philharmonic will embark on the 2020 European tour, April 30–May 12, 2020, led by Jaap van Zweden in his first appearances with the Philharmonic in Europe. The tour will feature ten performances in London, Cologne, Luxembourg, Amsterdam, Berlin, and Dresden. In Amsterdam, Jaap van Zweden and the Orchestra will open the Concertgebouw’s Mahler Festival 2020, celebrating the Philharmonic’s former Music Director in the hometown of its current Music Director. The Orchestra will perform works by Mahler, Mozart, and Shostakovich; soloists will include Artist-in-Residence Daniil Trifonov, Roderick Williams, Joélle Harvey, and Sasha Cooke. The Orchestra will return to China July 2–8, 2020, for the Shanghai Orchestra Academy and Partnership and annual China tour. Philharmonic musicians will teach at the Shanghai Orchestra Academy, and the Orchestra will perform on its annual China tour, including appearances at Shanghai’s Music in the Summer Air (MISA) festival and Guangzhou’s Xinghai Concert Hall. The Philharmonic will be in residence at Oklahoma State University (OSU), October 11–13, 2019, performing the inaugural concerts of the new McKnight Center for the Performing Arts on the OSU campus in Stillwater. Jaap van Zweden will lead the Philharmonic in three programs at the McKnight Center, two featuring Tony Award winner Kelli O’Hara — an Oklahoma native and the soloist in the Philharmonic’s opening subscription program in New York — and one featuring Concertmaster Frank Huang. The residency will also include educational opportunities for OSU students with Philharmonic musicians, including master classes. The Philharmonic will return to Colorado’s Bravo! Vail music festival for its 18th annual residency, July 22–29, 2020. The New York Philharmonic will present several movie scores performed live to the complete films throughout the 2019–20 season. The seventh annual The Art of the Score — with Alec Baldwin as Artistic Advisor and conducted by Richard Kaufman — will feature two New York Premiere screenings: Steven Spielberg’s Close Encounters of the Third Kind in Concert with John Williams’s Oscar-nominated, Grammy-winning score performed live to the film, September 11–12, 2019, and Alfred Hitchcock’s Psycho in Concert with Bernard Herrmann’s score performed live to the film, September 13–14, 2019. The Philharmonic will also present Harry Potter and the Sorcerer’s Stone in Concert with John Williams’s score performed live to the film, conducted by Justin Freer, December 11–14, 2019; the New York Premiere screening of Singin’ in the Rain with Nacio Herb Brown’s score performed live to the film, conducted by David Newman, on the Spring Gala, May 20, 2020; and Disney’s Mary Poppins in Concert with the Sherman Brothers’ score performed live to the film, conducted by David Newman, May 21–23, 2019. More information is available at nyphil.org/film. Susanna Mälkki returns October 18–19 and 22, 2019, to conduct The Marie-Josée Kravis Prize Winner Unsuk Chin’s Šu, for Sheng and Orchestra, with Wu Wei as soloist in his Philharmonic debut. Philippe Jordan returns October 30–November 2, 2019, to conduct works by Prokofiev; Mendelssohn, with violinist Julia Fischer as soloist; and Beethoven. Esa-Pekka Salonen returns November 6, 8–9, and 12, 2019, to conduct two of his works, including the New York Premiere of Castor; Schoenberg orchestrations of works by J.S. Bach; and Hindemith. Santtu-Matias Rouvali makes his Philharmonic debut November 14–16, 2019, conducting the New York Premiere of Bryce Dessner’s Wires, with the composer as soloist on electric guitar in his debut. Daniel Harding returns January 9–11, 2020, to conduct works by Grieg, with pianist Paul Lewis as soloist, and R. Strauss. Gustavo Dudamel returns for two consecutive weeks: January 15–18 and 21, 2020, to conduct works by Ives; the New York Premiere of Esteban Benzecry’s Piano Concerto, Universos infinitos, with Sergio Tiempo as soloist in his Philharmonic debut; and Dvořák, and January 23–25, 2020, to lead works by Schubert and Mahler with mezzo-soprano Michelle DeYoung and tenor Simon O’Neill. Simone Young returns January 30–February 1, 2020, to conduct the New York Premiere of Brett Dean’s Cello Concerto, with Alban Gerhardt as soloist in his Philharmonic debut. Franz Welser-Möst returns February 27–29, 2020, to conduct works by Jörg Widmann and R. Strauss. Valery Gergiev returns March 12–14, 2020, for an all-Russian program featuring works by Shchedrin; Rachmaninoff, with pianist Denis Matsuev as soloist; and Stravinsky. Pianist Lang Lang performs Beethoven’s Piano Concerto No. 2, led by Jaap van Zweden, in the Fall Gala, October 7, 2019. Pianist Emanuel Ax returns October 24–26, 2019, for Beethoven’s Piano Concerto No. 1, led by Stéphane Denève. Pianist Yefim Bronfman returns December 5–7, 2019, for Beethoven’s Piano Concerto No. 4, conducted by Jaap van Zweden. Violinist Janine Jansen returns February 13, 15, and 18, 2020, for Brahms’s Violin Concerto, led by Jaap van Zweden. Mezzo-soprano Isabel Leonard returns March 5, 7, and 10, 2020, in a French program featuring Ravel’s Shéhérazade, led by Louis Langrée in his Philharmonic debut. Concertmaster Frank Huang performs Lalo’s Symphonie espagnole, March 26–28, 2020, conducted by Andrés Orozco-Estrada in his Philharmonic debut. For more information on the New York Philharmonic’s 2019–20 season, its education programs, and more, visit: nyphil.org/addendum. PurePoint Financial. Season Sponsor of the New York Philharmonic. Programs are made possible, in part, by the New York State Council on the Arts with the support of Governor Andrew Cuomo and the New York State Legislature. Photography and video are available in the New York Philharmonic’s online newsroom, nyphil.org/newsroom/1920, or by contacting the Public Relations Department at (212) 875-5700 or PR@nyphil.org.